The project is created in order to popularize the new flute repertoire and attract young talents to the performance of new works of the 21st century. Participants will have an excellent opportunity to show their achievements to a large number of professionals around the Globe. The project is supported by Mobile app "All about Flute" (www.allaboutflute.org), and by more than 20 sponsors all over the world. Participants must be no older than 35 years old in 2018. Participants must use original sheet music purchased. CONCERTO is published by ALRY Publications (USA). List of sellers is written below. 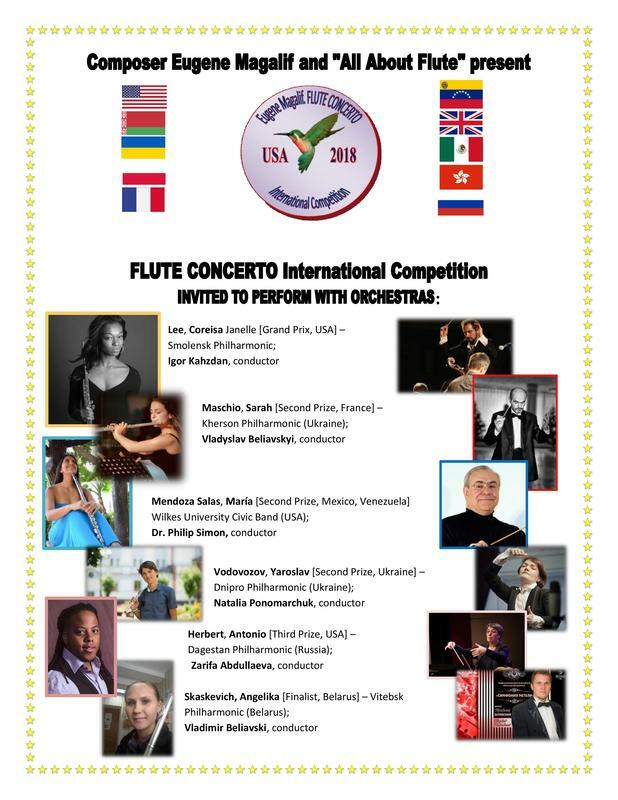 Participants must submit application, pay fee and send application by e-mail with attachment to Eugene Magalif at emcomposer@gmail.com no later than October 1st, 2018.
International Jury will choose about 10-12 finalists and the best performer (Grand-Prix Winner) of E. Magalif's Flute Concerto among them. All finalists’ videos will be featured on "All about flute" app and get additional voting from the app users. Grand-Prix Winner and Public voting Winner (second place) will be awarded with SONG Silver Head Joints each. 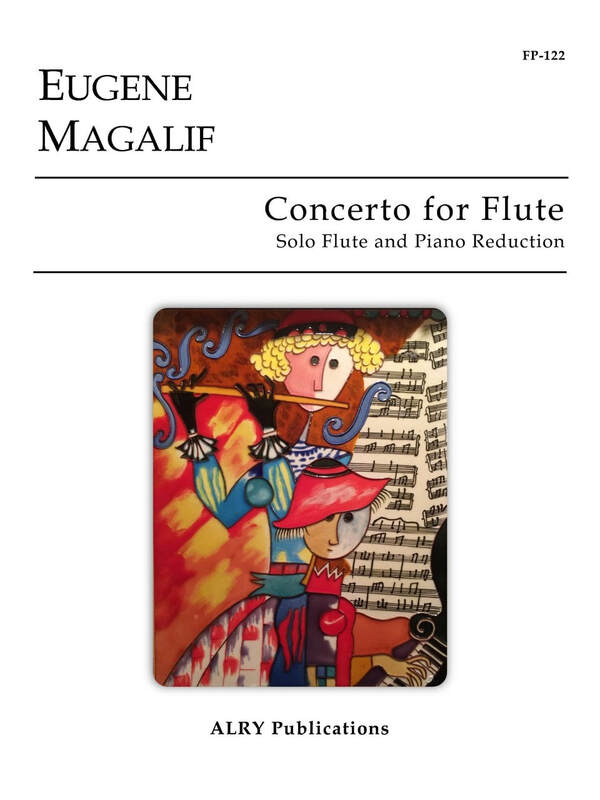 Third place winner will be awarded with handcrafted flute box of rare Manila wood from SDC Optima Co. All finalists will be awarded with Diplomas, books with Eugene Magalif’s flute music from the publishers with composer’s autograph and personal Thank you letter. Some finalists, who will be chosen to perform with orchestras, will get financial support to help them pay their travel expenses. Additional prizes from the composer and the Chairman of the Jury can be possible if there will be deserving participants. 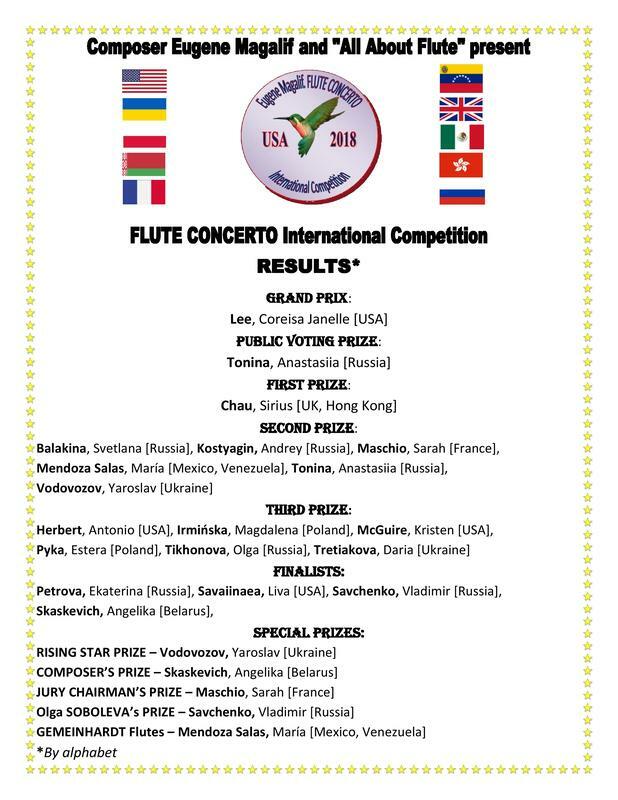 The Winners and Finalists agree for their names, biographies and videos to be used by FLUTE CONCERTO COMPETITION for promotional purposes. The winners will be announced on December 1st, 2018 through "All about Flute" and its social media (Facebook, Instagram and LinkedIn). You will see the results on Eugene Magalif’s Facebook page too. By signing application participant agrees with Rules and Regulations of the FLUTE CONCERTO COMPETITION. Q. In the 3rd Movement of the CONCERTO there are a few measures with use of beat boxing or singing. Is it mandatory or optional? A. This is optional. If you are not familiar with beat boxing or singing while performing – it will not be counted against you. Just play melodic line. Q. Can I record each Movement separately? A. Yes, as long as you don’t stop the video recording in the middle of the movements. Q. Do I have to memorize the CONCERTO or I can use sheet music during the recording? ​A. Yes, you don’t have to memorize. Use sheet music.